Have you ever argued a certain point using logic and evidence to support your arguments? If you have answered yes, then imagine doing that in an essay format – that is what writing a persuasive essay is like. You have to write an essay trying to convince the reader that your point of view is more valid than others. But this is easier said than done, and if you are having problems writing a persuasive essay, we have the perfect step-by-step guide that will help you produce a masterpiece. Have a stance. What is your take on the issue? What side are you on? Think about it and take a side. Understand your audience. Make sure that you understand the types of people that will be reading your essay. Some people might be on your side while others may not. There might even be some people who are on the fence. Look at the issue from all angles to better communicate with your audience. Research the topic comprehensively. Find strong evidence that you can use to make a strong case for your position. It can be in the form of quotes from experts, logical arguments and facts. After doing the necessary preparations to write your essay, you need to structure it. The structure will be the same as any other essay, and your professor will most likely provide you with one to follow. But if you are left to figure that one out for yourself, the typical structure of an essay includes an introduction, body, and conclusion. Usually, a persuasive essay has 5-6 paragraphs, so make sure you dedicate 3-4 of those paragraphs to discussing each of your arguments. The introductory paragraph of your persuasive essay is the perfect place to give the reader an overview of the arguments you are presenting and the relevant background information. You should also start the introduction with a hook, something that will grab the reader’s attention and not let go. Your introductory paragraph also needs a thesis statement, which tells the reader the stance you have taken and wish to argue. You should also tell the readers how you are going to argue (with evidence, quotes, facts or something else). That last thing your introductory paragraph needs is a sentence that will transition the reader to the body section. The body is where you will talk about each argument that supports your position, giving each argument a separate paragraph. Make sure you start with the strongest argument in your arsenal and end up with your weakest argument. Each argument should also be followed up with the necessary supporting details in order to make your position more convincing than the rest. Supporting your arguments is important because it prevents them from coming across as pointless. To round up the body, you should dedicate an entire paragraph to addressing the view that opposes yours. Describe the arguments that seek to undermine yours and refute them. You can’t expect that everyone reading your essay will agree with you. So it is best to address them as well. Do not forget to include a sentence in the last paragraph of the body that will transition the reader to the conclusion of your essay. Now that you know the steps required to write an introductory paragraph and body that will make your persuasive essay a masterpiece, it is time to conclude the essay. 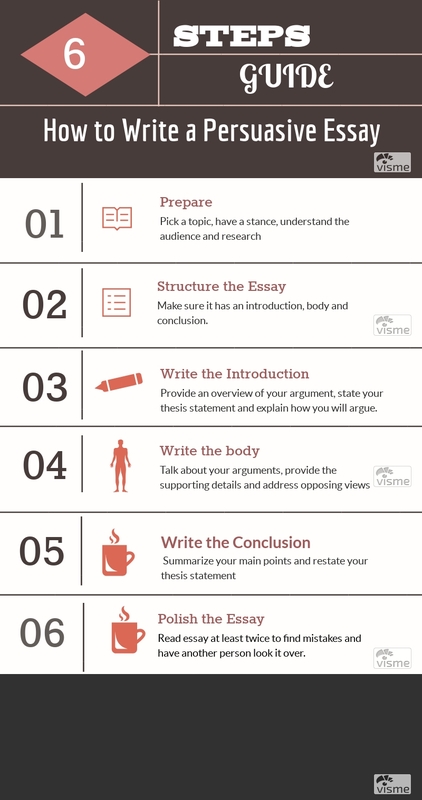 To write a good conclusion, you need to summarize all your arguments, restate your thesis statement, and avoid making any new arguments. You need to do this in order to persuade your readers into taking the same stance as you (after all, that is the whole point of writing this type of essay). Also, do not just conclude without leaving your reader with something to ponder. After your reader finishes reading your persuasive essay, they should ask themselves what steps they should take next to further understand their newly-adopted stance. Now that you have finished your essay, let it sit for at least a day. Even when you are not actively working on the essay, your mind will continue to do it subconsciously. The next time you look at the essay with a fresh pair of eyes, you will be able to refine and edit it effectively. After you have refined your arguments and corrected the grammatical and spelling mistakes, let another set of eyes look at it. Other people (peers or your professor) will be able to spot the mistakes that you may have missed and tell you if your argument makes sense. When you receive their feedback, do not take it personally and use it to make your persuasive essay better. So there you have it, the necessary steps to write a persuasive essay that convinces your readers to adopt your position. Keep them on hand if you want to write a masterpiece. If you are still finding it difficult after reading these great tips you can always buy cheap essays online with the help of a custom writing service. You can hire them to write a masterpiece for you, whether it is a custom persuasive essay, custom research paper or custom dissertation.